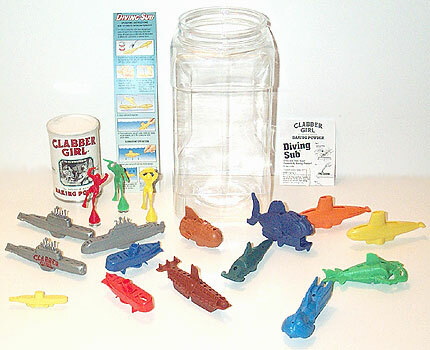 This page is dedicated to my baking powder submarine collection (sometimes refered to as baking soda submarines). After doing a lot of searching on the net about them, I quickly found that there is no real center place to find out about them. While there are many matches on the net, most of them are selling them, while others mention them in passing. I wanted to put together an information page where people who want more info on them can go. So far I've broken this page into 3 parts. They consist of a Baking Powder Submarine FAQ, a Tips section, and a Buying section. You can also check out the Baking Powder Submarines Discussion located in The Torgo Forums! What are Baking Powder Submarines? While they come in all shapes, colors & sizes, they all work on the same concept. Baking powder (not baking soda) is placed into a small compartment, and when placed in water the sub begins to dive & surface. In the past they commonly came in cereal boxes & cereal box mail always. There are also other versions out there which are not submarines. These include Navy Frog Men, which also came in cereal. I also have a killer whale & dolphin which do the same thing & I have a very large variation of one, which is a GI-Joe submarine. It's workings are a little different, however is also powered by baking powder. There are also boat variations (most widely known is Kellogg's PT Boat), which don't dive, but are propelled across the surface of water using a similar principal. Are Baking Powder Submarines like Baking Soda Submarines? I actually once purchased a set labeled in two separate places as being powered by baking soda. However, upon reading the actual instructions they stated to use baking powder!!! So when I look for baking powder submarines, I use baking soda submarines interchangeably. Because they're pretty much ALL are baking powder subs. Baking powder is made up of sodium bicarbonate (baking soda), and cream of tartar (an acid). When mixed with water, the two compounds react with each other producing carbon dioxide gas. Baking soda alone will not react in water! How do Baking Powder Submarines work? There is an area inside the baking powder submarine that holds baking powder. This area closes up completely, except for a small hole or series of holes on the bottom of the submarine. When placed into water, the submarine sinks. After several seconds the baking powder reacts with water to produce carbon dioxide bubbles (carbon dioxide is completely safe & non-toxic). As a result, a small air bubble is formed underneath the sub which gives it just enough buoyancy to rise to the top of the water level. Once the submarine hits the top of the water level, the submarine tilts to the side. As a result the carbon dioxide bubble is released from underneath the sub, and the sub sinks back down. As it goes down it continues to produce more carbon dioxide, and once again the submarine rises. The entire reaction can go on for some time, and the submarine will dive and resurface many times. The Clabber Girl baking powder company has a long detailed scientific description of exactly what happens. It includes the chemical reactions and so forth. Who cares about Baking Powder Submarines? Me, for starters. Being you can find them all over the net & on eBay, I would assume others as well. In fact some of the originals made by Kelloggs commonly go for $10-$20 on eBay at any given time. There is also a rare find out there that I once tried to bid on, but lost after it finished at nearly $100. As to why people care, that I can't answer. I can't even tell you for sure as to why I like them. One factor that most likely comes into play has to do with their simplicity and effect. Baking powder submarines can go for quite some time without using a single battery or any manual interference after it starts. Its almost remarkable that the toy dives and resurfaces countess times simply by adding a powder most households have in their kitchen cupboard. Who invented Baking Powder Subs? In 1953 Benjamin & Henry Hirsch, owners of a small cosmetic lab, discovered that the gas (carbon dioxide) created when baking powder comes in contact with water could be used to raise a submerged object. Delighted with their discovery they made a crude model of a submarine that could dive and surface & presented it to a major cereal company in nearby Battle Creek, Michigan. The rest is history. Introduced in 1954 for twenty-five cents and one box top, the four-and-one-half inch long working model of the submarine U.S.S. Nautilus required three shifts to keep up with orders. By May of that year over one million subs had been produced and work was started on a two-and-one-eighth inch give-away version. The success of the toy submarine transformed Hirsch Laboratories, the cosmetic company, into a premium company almost over night. Over the next seventeen years the Hirsch Brothers would create a long line of premium hits that would establish themselves as the undisputed leaders in their field. Their diving U.S. Navy Frogmen and working PT boat, both offered in two sizes, and the amazing Magic Moon Garden brought joy to millions of American children and adults alike. After doing some research, I found several patents for different models. The first being filed by Hirsch for a Kelloggs model. I assume there is an earlier patent, but I have not been able to find it yet. I've manually turned the bottom patent shown above into a high quality PDF version. I also created a couple high quality posters on The Torgo Store. This patent is for the one that came in Shark Bites fruit snacks (as I have 3 of them). There's also a website that sells a copy of the original Kellogg's patent matted for framing. I've ordered a copy & hung it up in my bathroom, next to a shelf I got to display my submarines on. It appears to be the same one shown in first patent shown above, however the drawings are a little different. How many different kinds of Baking Powder Subs are out there? This is a very hard question to answer. There are many different companies that made them. 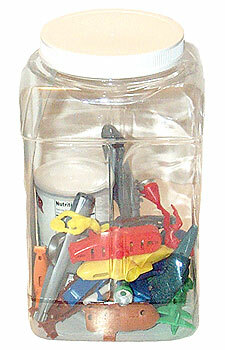 Most were made as toys included in kids foods boxes. As of now many companies sell them as reminders from childhood. I got my first one out of a box of Shark Bites fruit snacks. Most recently Kelloggs offered them in boxes of Frosted Flakes, in the form of submarines from Disney's Atlantis. Since I started collecting them, I've obtained somewhere around 15 different types (not including color variations). I know for certain there are at least 4 or 5 types that I currently do not have, probably more. How do I make my own Baking Powder Sub? I have a Submarine that used Diving Tablets, where can I get more? Your in luck! Those little diving tablets are simply a pressed form of baking powder. Assuming you can get the baking powder into the hole where the tablet went, it will work exactly as it was designed to. Where can I buy a Baking Powder Submarine? There are a lot of different places to get them now. Below I have some buying links to buy them online. You can also try looking in novelty stores. And of course you can find several sites that sell them by doing a search on Google. And of course, there's eBay. I have an eBay list I've created on the bottom of this page. I devised the search term after spending some time scouring eBay trying to find as many as possible. You can also bookmark this eBay search by dragging the following link to your bookmark bar: BPSubs on eBay. Note that it's best to use this specific link, as I frequently update the search to be more accurate. Are there any pictures of the Subs on this site? This is my BP Sub Kit™. Everything is nicely held in this container. You can see all that is currently in my kit here. I have a copy of all the directions I have for them (the blue one to the left is off a Fruit Loops box), along with my Baking Powder. I keep one of each type of sub I have in the kit, while my duplicates are in a Fruit Loops box. Here my kit container is in use. Being the container is completely clear, it's easy to see the sub in action! Try adding a few drops of liquid soap to the surface of the water. Though I've not tried this myself, the directions that came on a Fruit Loops box indicates this will allow the submarine to "operate better". 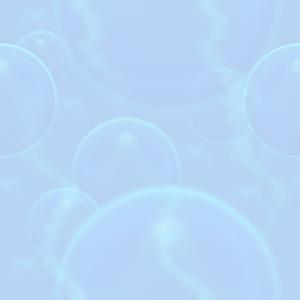 Wash off any excess baking powder, and shake out any excess bubbles after placing it in the water. Replace the water after using it for a while. It will get cloudy and stop working as effectively. Fill the baking powder slot up completely. If you are using a sub that has a top and bottom half, fill up the bottom half completely. 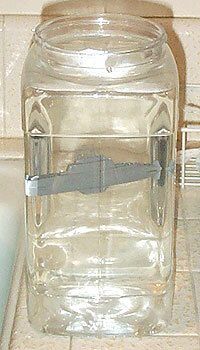 Excess air bubbles can prevent the sub from sinking. If the sub is heavier, too little air will keep the sub from floating. If you have trouble getting the sub to start diving & surfacing, try turning the sub over & shaking it while it's under water. This will help the water make contact with the baking powder & jump start the process (I found this from personal experience). If all else fails, completely rinse all the baking powder out of the sub, dry it off completely, then try again. Air or water in the wrong place of the sub can cause the sub not to function properly. Diving Sub. Fill this sub with baking powder. Watch it dive and resurface! Submarine measures 4-1/2 inches x 1-1/2 inches.